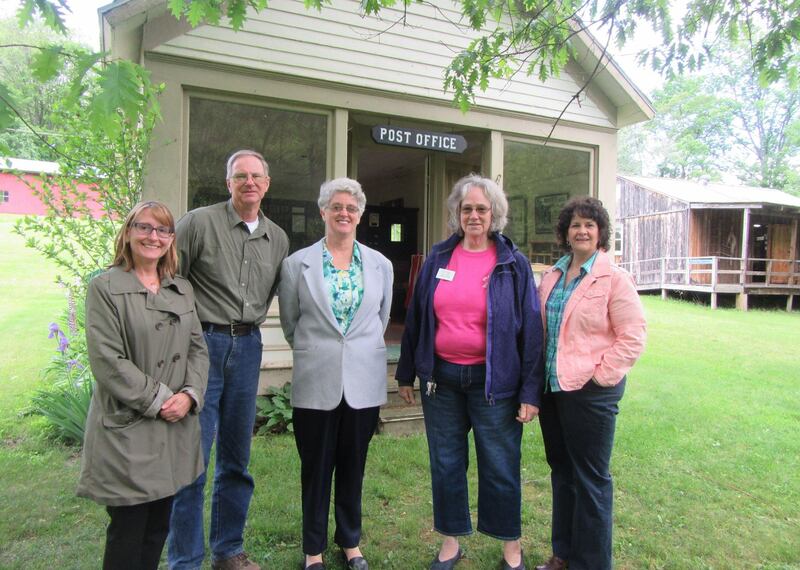 Old Mill Village Museum director Sue Bennett Dyson (above, second from right) provided a tour of the Old Mill Village near New Milford to Endless Mountains Heritage Region director Annette Schultz (from left), Endless Mountains Heritage Alliance president Ed Zygmunt, Clifford Historic Society president Sandy Wilmot, and Susquehanna County Commissioner Betsy Arnold on June 7. Behind them is the former New Mildred Post Office, one of many structures that was spared demolition and moved to the Village. A portion f the interior can be seen at top. Members of the Endless Mountains Heritage Alliance (EMHA) met at the Old Mill Village Museum in New Milford Township on June 7, where they were apprised of a number projects throughout the county that have received funding through the Endless Mountains Heritage Region (EMHR) and by DCNR and other partner agencies. EMHA is the organization that manages the EMHR. Museum director Sue Bennett Dyson welcomed the group, which included Susquehanna County representatives Ed Zygmunt, Bobbie Jo Turner, Sandy Wilmot, and Betsy Arnold. Dyson explained that the Old Mill Village site has been independent from Pennsylvania Historical & Museum Commission (PHMC) for six months and is open to fresh ideas and new funding streams. 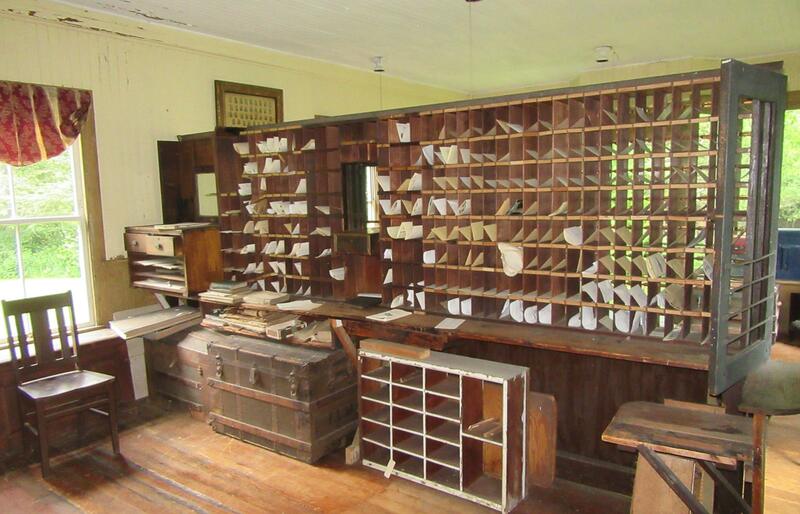 Wilmot is also the president of the Clifford Historical Society. She was pleased to report that additional progress has been made on the Clifford Children’s Garden, The Museum of Natural History, Yarn’s Cider Mill, and Clifford Township Park, each of which has benefited from funding through EMHR. Restrooms at the 24-acre park park have been completed, and walking trails have been improved, providing a flat walking area that appeals to to both senior citizens and children. “Even the township supervisors are amazed at how much use it’s getting,” said Wilmot. 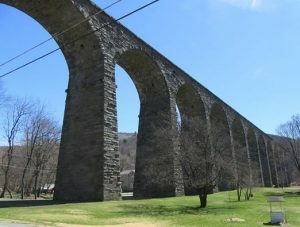 Turner, who also works for the Susquehanna County Housing & Redevelopment Authority, related that she has been working with the PA Rail-Trails organization to officially designate Forest City as a Trail Town. Turner also noted that a section of the old railroad bed near Lanesboro has been targeted for improvement as a rail trail. EMHR Greenways coordinator David Buck related that Dana Rockwell and Peck Melbauer of Susquehanna Depot are planning a second annual River Festival there. Last year’s festival drew more than 60 participants, including 25 who took part in a canoe and kayak race. Buck expects this year’s event, slated for Aug. 5 and 6 to be even bigger. “It’s a very active group,” he stated. Rockwell and Melbauer just completed a paddling trip of the entire 444 miles of the Susquehanna River in a kayak they build themselves, thus becoming the newest members of the 444 Club, which is managed by EMHA for river enthusiasts. 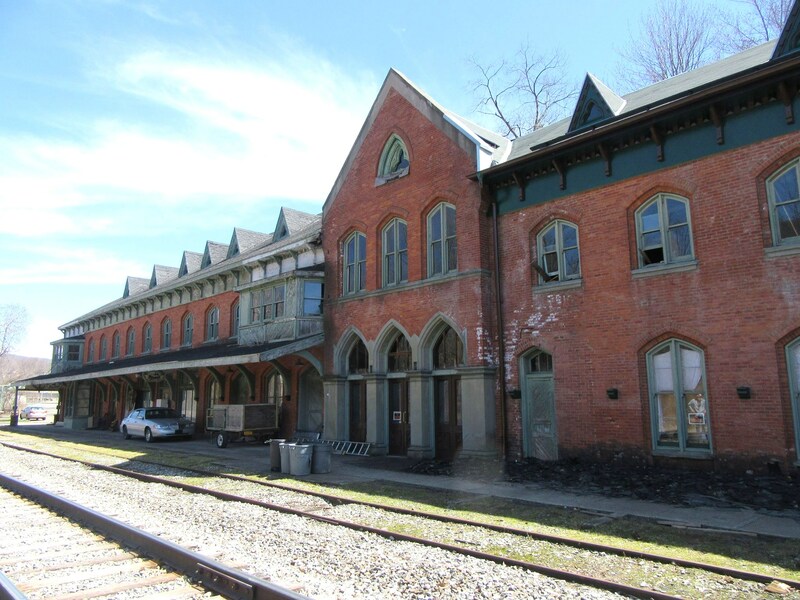 EMHR executive director Annette Schultz reported that an application has been submitted for a PHMC/DCNR grant for a historic structures report and re-use plan for the Starrucca House (below), the old train station in Susquehanna Depot. Confirmation of the grant should come in August. In the business portion of the EMHR board meeting, it was announced that projects and grants coordinator Hillary Robinson would be leaving the area after three years with the organization. She was thanked with a round of applause for her work and dedication. Robinson will remain with EMHR through the end of June.